The Little Round Table: Thanksgiving Dinner Menu Plan - More Possibilities! Thanksgiving Dinner Menu Plan - More Possibilities! 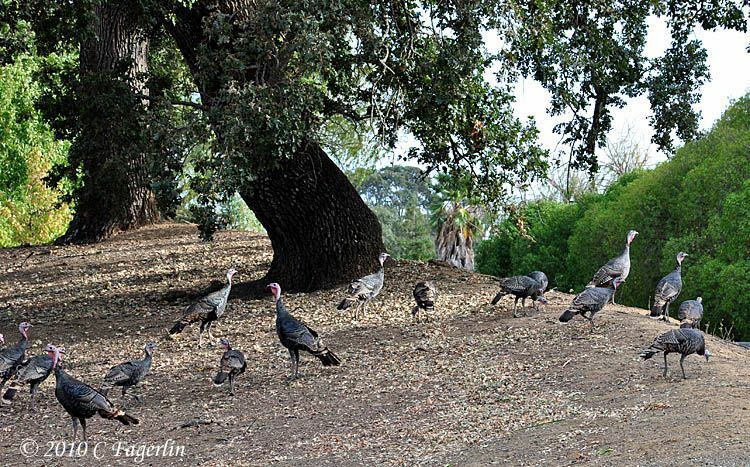 It's time for Outdoor Wednesday again over at A Southern Daydreamer! 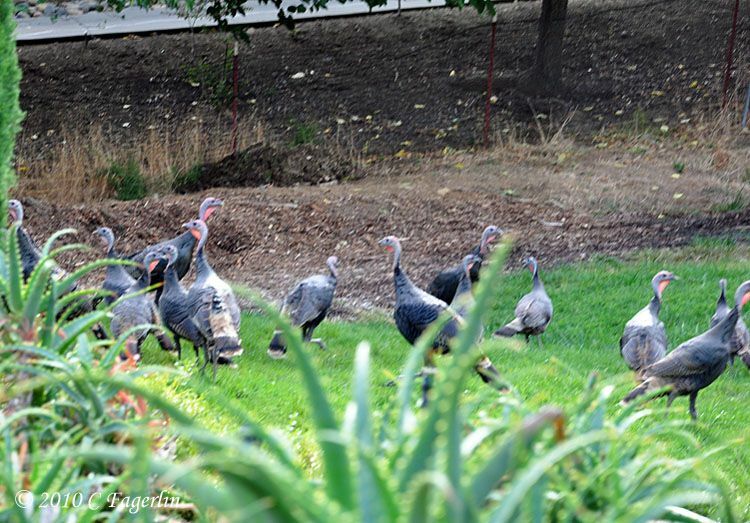 More possibilities for our Thanksgiving dinner showed up yesterday! Because the King and Queen says so! I came upon them unexpectedly, so the first couple of images are pretty darn blurry. They were digging for grubs on the front of our property down at street level. 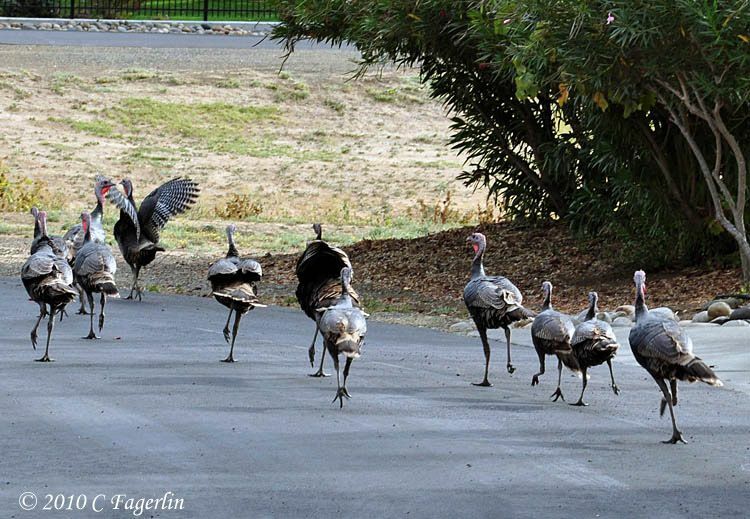 "Hey you guys, run run run! It's the lady that's always talking about cooking us!" Hitting the pavement at a fast clip. All those little feathered butts! slow down always keeping me at a safe distance. "She's still coming! Head for the park guys!" And the other half decided to do the race-track maneuver. "We're safe now ...... I don't think she can see us up under the tree!" That's it for Outdoor Wednesday this week, thanks for coming by! Very cute post. 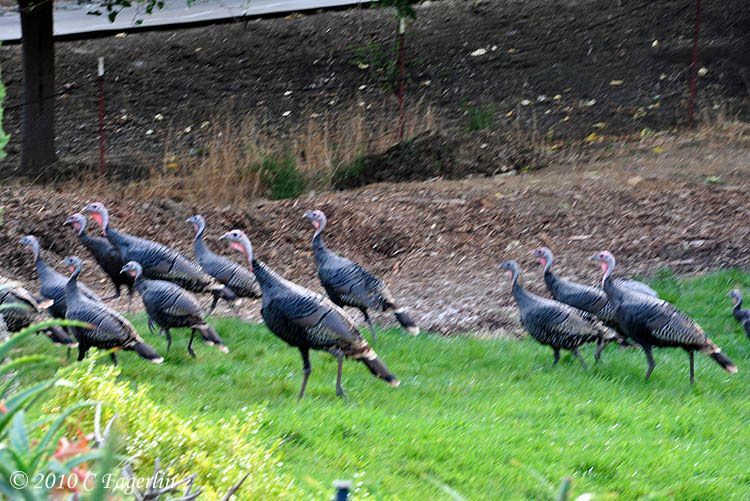 The turkeys are certainly headed for cover. Like reading the eeny-meenie-minie moe poem. 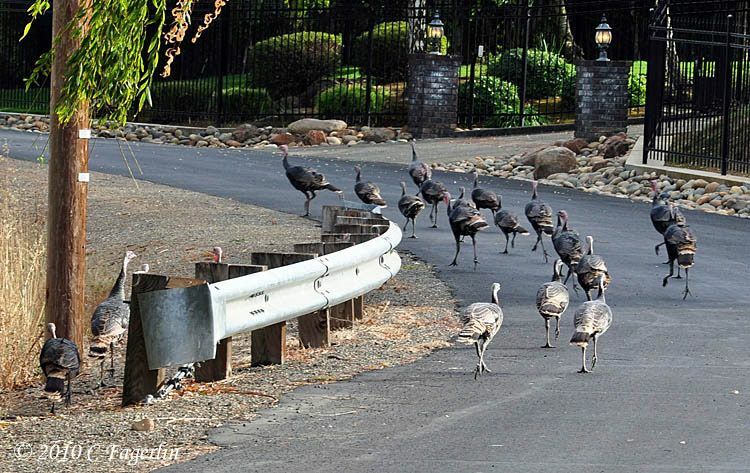 Great goodness,these turkeys better get out of town,literally!...YES GET OUT OF TOWN! cute post,great shot's,maybe if they keep hangn' round,one of them will be guest at the round table. Wow! 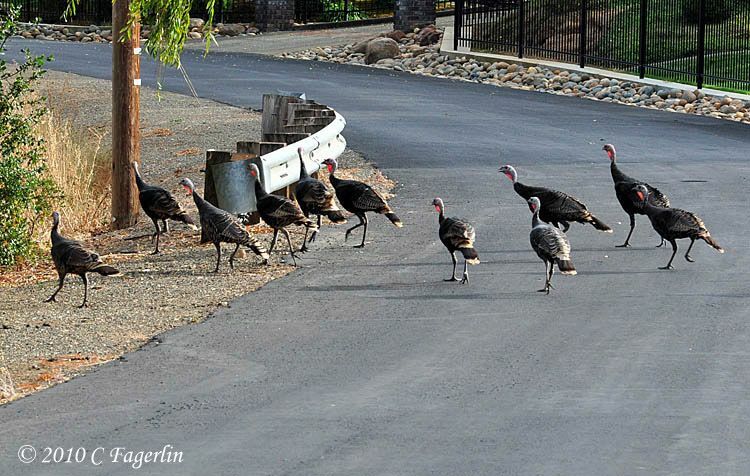 Amazing to see that many turkeys all together. Great pictures. They're just so amusing! Thanks for the great photo essay. They would make a lot of Thanksgiving dinners!! Funny post, I love the racetrack shot. 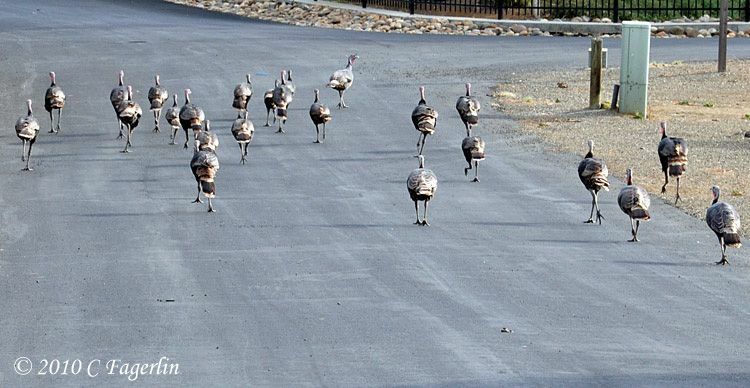 Run turkeys, run and hide. 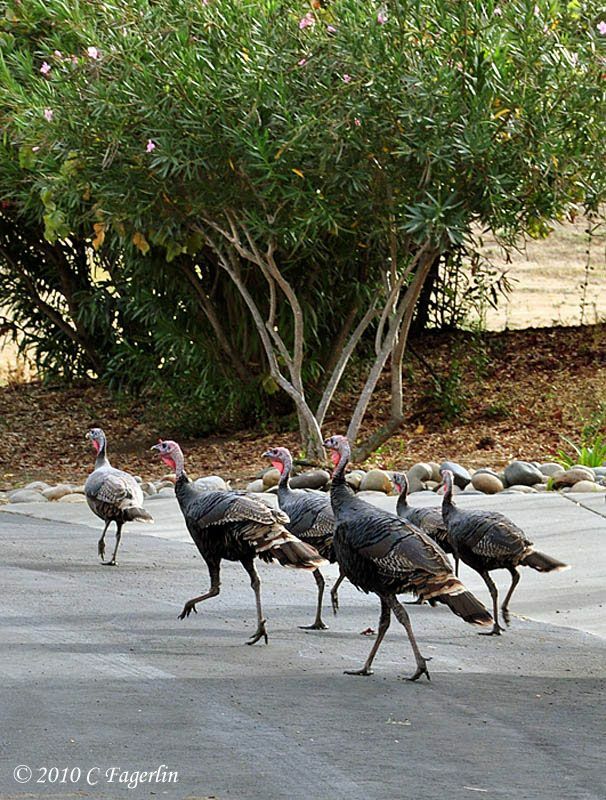 Thanksgiving is one of my favorite holidays, and I think the turkey has a lot to do with it!! I want to invite you to a Happy Hour link party. Show off your barware and share you favorite cocktail recipe. Would love to have you link! What a great post! It was very fun to read, and the pictures are super! Turkeyville at your place for sure. Did you purchase cranberries yet? Your outdoors pictures are so beautiful. Especially the Turkey's. 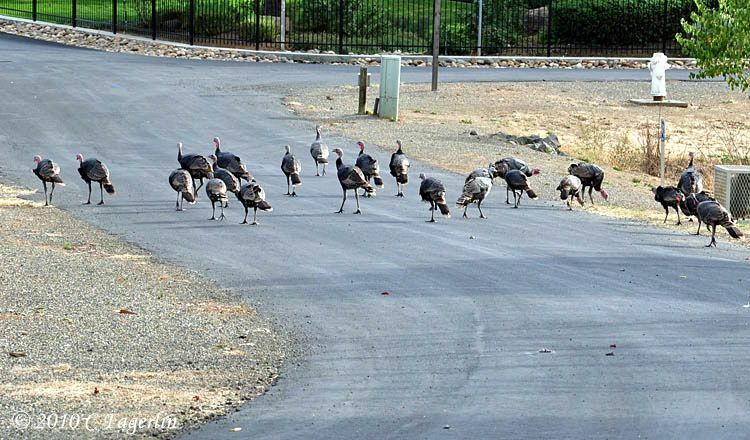 And these turkeys are not the smartest of birds, but surely among the most amusing. Cute story Jane, and yes Joyce .... I do have cranberries ready! Thanks so much for coming by to visit with my favorite clowns in the neighborhood!